Plone Hosting Service and Zope Hosting Service - list of available Hosting Packages, including Zope/Plone Hosting Instance Package, and Hosting on Virtual Server Packages. Quintagroup is a long-experienced Plone CMS hosting services provider. Our team is an expert in Plone Content Management System so you can always rely on our professional and friendly assistance. For your Plone/Zope websites Quintagroup provides reliable, secure and powerful hosting services. We offer several hosting packages to customers with small requirements & low traffic as well as to customers with large requirements & high traffic. Consider Quintagroup's Plone Hosting services, designed for large businesses that require a rich, high-performance website and depend on fast, rock-solid email service for day-to-day operations. Our Plone Hosting Instance Package comes with a dedicated Zope Web server, so that you can install your own Plone extensions. Plone Hosting Instance package features more Active RAM than Zope Hosting Instance package. It includes 10 Plone websites which you can map to your 10 domains. Quintagroup offers powerful Virtual Servers for our clients to run their Zope/Plone websites on. Virtual servers offer almost all the benefits of having a full dedicated server, with full control and better performance than shared hosting, but without the high cost of a traditional dedicated server. With our Virtual Server Hosting packages multiple Zope Instances can be hosted on a single Virtual Server, each with its own domain name. 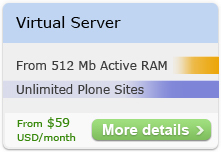 Our Virtual Server plans range from $59 to $179 per month. Quintagroup offers powerful Zope Hosting that combines rock solid reliability with outstanding service and support - and all at reasonable prices. Our aim is to ensure your every hosting need is fulfilled. We are convinced that once you have experienced the power and flexibility of Plone / Zope you'll never want an ordinary website again. Zope Hosting Instance package is a basic hosting package, that includes 1 Plone site and 9 Zope websites. You can map only 1 Plone site to your domain. Quintagroup Plone/Zope Hosting is the perfect choice for many Plone users. Our customers are satisfied with the excellent performance of their Plone web sites, hosted on Quintagroup servers.